For many businesses, your web site is the main line of communication between your customers and your company. see to choose you over a competitor. I invite you to click on the images below to view a sample of past and current clients. 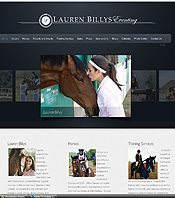 Lauren Billys requested a quick turnaround on a dynamic and interactive website. Her needs were to feature her horses, her accomplishments as a rider as well as feature sponsors and collect registration information for upcoming fundraiser's and events. This was accomplished with the use of a custom wordpress theme. Lauren's current goals are to compete in the American and Caribbean Games in 2014, the Pan American Games of 2015, and the Olympics in 2016, as well as moving up to advanced and eventually competing at the four star level of eventing. 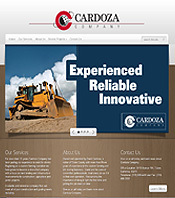 Cardoza Company, a land leveling, grading and custom farming company, contacted us to develop a website featuring past work and general company information. Goal of their website was to generate leads for new business.